Image: Domnitsky/Shutterstock. Balbaz/Shutterstock. Design: Ashley Britton/SheKnows. Everyone has moments of really, really wanting certain foods, but there’s no craving like a pregnancy craving. Speak to a group of moms, and you’re guaranteed to hear at least one story about eating the same thing every day for an entire trimester — or creating a sandwich filling that most (non-pregnant) people would recoil in horror at the mere thought of. So what’s the deal with pregnancy cravings? What are the foods pregnant women crave most — and why? Typically, the craving-causing culprit is thought to be the hormonal changes that happen during pregnancy, but there’s no data to support this theory. “The truth is that no one truly understands why pregnancy induces food cravings in many women,” says Gersh. But there are many theories — some more interesting than others. “One theory is that there are survival benefits; the food craved increases the survival of mother and baby in some way,” says Gersh. In particular, the cravings of the second and third trimester help replenish the necessary nutrients that weren’t obtained during the first trimester (due to common nausea and vomiting). Spoiler: All pregnancy food cravings are considered normal — yes, even those pizza-with-applesauce combos. “Cravings during pregnancy are very individual,” Patrice Harold, M.D., director of minimally invasive gynecology at Detroit Medical Center’s Hutzel Women’s Hospital, tells SheKnows. “Women may have cravings for salty foods, sweets, sour foods, or combinations of unusual pairings, i.e., pickles and peanut butter.” As far as the experts are concerned, there’s generally no meaning to the cravings, but it’s a topic that’s perfect fodder for old wives’ tales; legend has it that if you’re having a girl, you crave sweet foods or dairy, and if you’re having a boy, you crave salty, sour or spicy foods. Some experts believe that pregnant women crave chocolate or dessert simply because they’re, well, desserts. In other words, the more “forbidden” a food is, the more we want it. So this could apply to candy, donuts and pretty much anything else that’s packed with sugar. 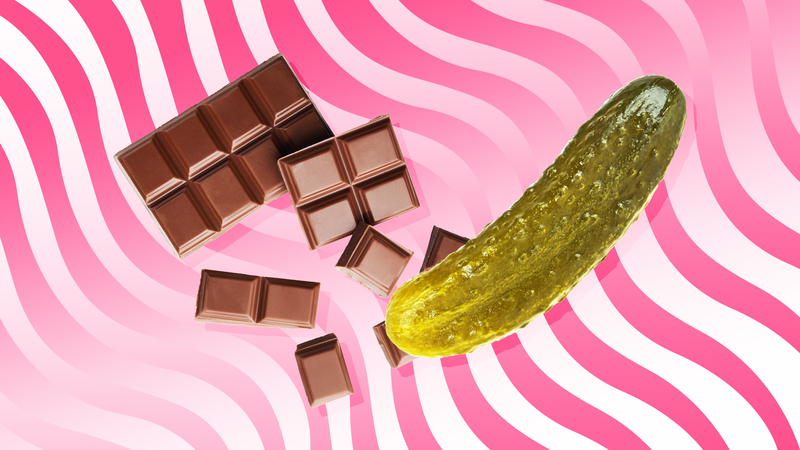 And what about if you like your chocolate with a side of pickles? That could mean you’re low in sodium — or, hey, maybe you just like the crunch. According to the International Foundation for Mother & Child Health, craving dairy products such as ice cream, milk or cheese, might indicate low levels of calcium. Then again, maybe you just really like ice cream. Should I give in to my cravings? If you crave unhealthy foods during pregnancy, it’s a good idea to keep a close eye on what you’re eating. “We would recommend that a pregnant mom should not eat the entire package of Oreo cookies — maybe just a few, or consider a healthier substitute,” says Harold. She also recommends always drinking an eight-ounce glass of water before eating an unhealthy snack — to make you feel full earlier and help avoid overconsumption. What can be even more dangerous is craving unnatural items or even harmful non-food substances with no nutritional value — such as paper, chalk, paint or dirt. This is related to an eating disorder known as pica, and is believed to occur due to iron or other mineral deficiencies. “These cravings should be shared with your healthcare provider so that you have a complete understanding of the risks to you and your baby, and tests should be performed to check for mineral deficiencies,” advises Harold. More research is clearly needed to fully examine pregnancy cravings and their origins. But then again, does their cause really matter? Because if your diet includes plenty of healthy foods, there’s no harm in enjoying whatever strange things (food-wise, at least) you’re craving during pregnancy. Besides, nobody in their right mind would dare question a pregnant woman’s right to eat pizza with applesauce.